With all these features our software will be an everyday assistant in your work with Oracle database server. Oracle Code Factory provides you with a convenient easy-to-use interface, so it really does not require a deep knowledge of Oracle from its users. You will hardly come across any difficulties when running implemented services. 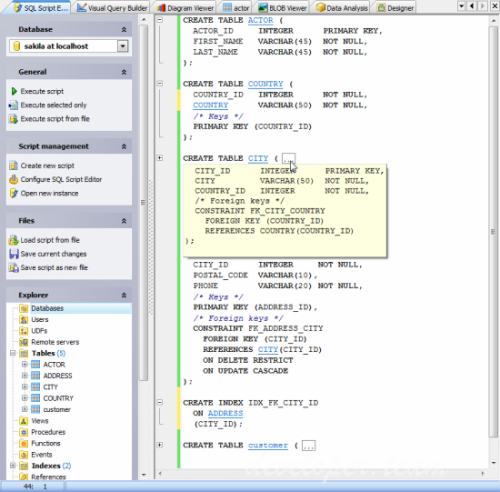 Oracle Code Factory supports SQL query syntax highlighting and code completion to prevent mistakes in syntax at once. Also it is possible to separate SQL scripts into regions that can be individually collapsed or expanded. Oracle Code Factory can execute each query in a separate thread in order to continue your work with the software while the query is executing. Use Oracle Code Factory to work with any Oracle version! The application provides full support for all the required features implemented in the new server versions. Oracle Code Factory provides you with all the features to analyze the data in the most convenient way. You can also export result sets to as many as 14 file formats including Excel, RTF and HTML and import data from Excel, CSV, text files and more. The Visual Query Builder is a powerful tool of Oracle Code Factory intended for designing queries as visual diagrams. This tool does not require any knowledge of the SELECT statement syntax, it will form a query automatically, you just need to mark what information you want to retrieve. Using Oracle Code Factory you can view or edit BLOB data in the following ways: hexadecimal dump, plain text, graphical image or HTML page. A graphical representation of BLOB data supports five image formats: BMP, Windows metafile, JPEG, GIF and PNG.